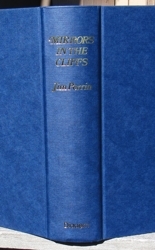 This is the first printing of the first edition of MIRRORS IN THE CLIFFS edited by Jim Perrin. 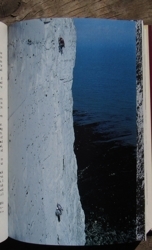 This book was published in London by Diadem in 1983. 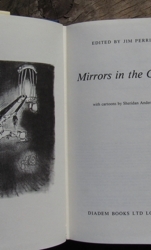 The book measures 223mm tall x 137mm, and has 688 pages, 12 color & 47 b/w photos, index, 26 climbing cartoons by Sheridan Anderson. 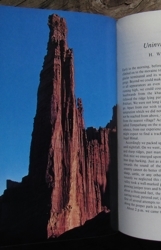 Excellent collection of 100 accounts from magazines, journals and books that follows up on the popular anthology, The Games Climbers Play. 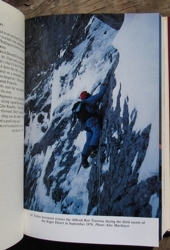 This anthology has mostly non-fiction accounts covering climbing worldwide. 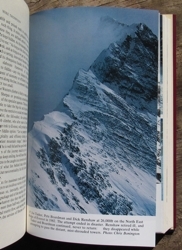 Reading of this thick volume will outlast most storms below high latitudes. 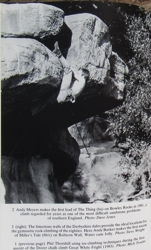 This anthology includes such classic accounts as Warren Harding Reflections of a Broken-Down Climber, Tom Patey A Short Walk With Whillans, John Menlove Ewards End Of A Climb, Eric Shipton Large Or Small?, Anderl Heckmair Hitler And Leni, and many more. 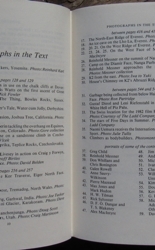 The complete table of contents is presented below in photos. CONDITION: Original navy boards, gilt lettering spine. 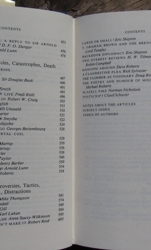 Both the dust jacket and book are in fine condition with no previous owner marks or writing on any pages, clean, no foxing, sharp. Never used. Purchased directly from the publisher (a couple of boxes) and kept in climate controlled storage for years.. Price: $15.